Bar-B-Q Shack E. Coli O157:H7 Outbreak: What Caused It? You are here: Home / News / Bar-B-Q Shack E. Coli O157:H7 Outbreak: What Caused It? 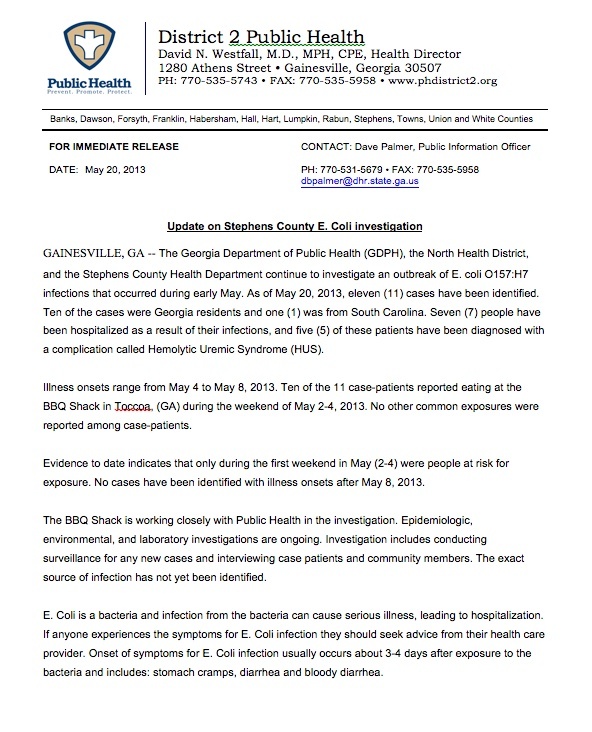 The E. coli O157:H7 outbreak at the Bar-B-Q Shack in Toccoa, Georgia that has sickened at least 11 people remains a mystery. Public health officials are investigating the outbreak, but they have not determined what caused the illnesses. Seven of the ill persons have been hospitalized, and five unfortunately have developed hemolytic uremic syndrome (HUS), a serious complication of a STEC infection that can cause kidney failure. That means this bacteria is especially virulent or that there were high numbers of the pathogenic bacteria in the contaminated food. According to FoodSafety.gov, E. coli O157:H7 is the worst serotype of this bacteria. It makes people very sick with severe cramps and bloody diarrhea. The bacteria produce Shiga toxins, which circulate in the blood and destroy red blood cells. The toxins are transported to the kidneys and central nervous system in the body, where they destroy cells, cause blood clots, and block the synthesis of protein. These actions damage the kidneys and can cause strokes. The most common sources for E. coli O157:H7 are undercooked ground beef, unpasteurized milk and juice, soft cheeses made from raw milk, and contaminated raw fruits and vegetables such as raw sprouts. People who are sick with an E. coli infection and prepare and serve food for others can also spread the bacteria. Public health officials are testing all of the food served to patrons of the restaurant as well as interviewing employees to see if they can find the bacteria responsible for the outbreak. 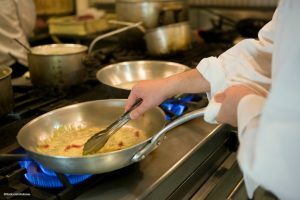 But many foods served at restaurants are simply not available for testing; they are either served to customers or thrown away at the end of the day. We may never know exactly what caused these illnesses, but it’s a good reminder for everyone to follow food safety rules and regulations.